Hello, friends. It's been a few weeks, hasn't it? I won't use this post to go into everything that has been happening in my life but if you are a regular reader, you know something must be up (other than this wretched health issue I'm battling) because things have been quiet and I haven't even been posting my photos of beauty every day, or almost every day. I'll just leave it, for now, with telling you that first, I've been playing Mama Hen to some incredibly sweet and precious baby chicks that became part of our family the day after they hatched. We started with five, but my favorite (Guinevere) didn't make it, as you know if you are on my facebook page. It was a traumatic event that I won't go into in this post. The other four - Snowflake, Peekaboo, Fluffy and Daisy - are staying healthy and strong and we look forward to having fresh eggs in several months. I'll share more photos of them and information about them when I have a chance sometime. Secondly, the photos of beauty have been missing partly because I've been so busy and partly because I accidentally formatted the compact flash card on my camera with a couple of weeks' worth of photos that I hadn't yet uploaded ... erasing every single one of them. HOWEVER, I made two cheap purchases on software and a card reader and got them ALL back yesterday! :) Again, I'll share some of those photos with you on another post - as well as tell you what I did to recover them in the event any of you ever find yourselves in a similar situation. 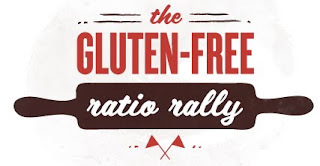 For now, let's get back to the reason for this post: The Gluten-Free Ratio Rally day is here again and this month we did bagels. Many thanks to Morri from Meals with Morri, our host for this month's challenge, for choosing bagels and hosting us this month! You can find her blueberry oat bagels (Yum!) and links to all the the rally participants' bagel recipes on her blog post here. 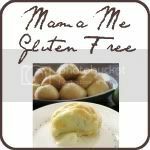 I'll have a list at the bottom of this post of the other recipes with links at a later time. I'm really looking forward to trying out some of these other bagel recipes, especially considering I'm just not as happy with mine as I wanted to be! 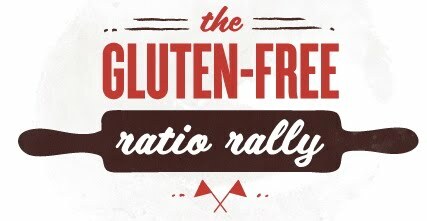 If you're not familiar with the ratio rally yet, it's where a group of bloggers come up with recipes based on a ratio for a specific gluten-free challenge each month. Working with ratio and weight frees you in your kitchen more than you can imagine. For more information and previous recipes and challenges, you can visit my rally page here. Before you get too excited about my "just plain bagels" recipe, let me tell you that I'm not completely happy with the way mine eventually turned out after trials, and I plan to keep at it and have a better recipe for you at some point. Given everything going on this month, I didn't get to play around with the bagels as much as I'd planned and nearly didn't write this post ... however I figured I'd keep it real and share my bagel-making experiences with you. This month was, after all, my very first bagel-making attempt - gluten-free or otherwise. The final result before deadline proved to be a decent sort of bread. I wouldn't think it fair to really call it a bagel - and I realize that's coming from someone who isn't from New York or anywhere in the Northeast at all. I do, however, think I have a pretty good idea of what a true bagel is and how it should taste. I've had them and they are good. My bagels turned out to be ... rolls with a hold in the middle? ... that taste quite good sliced in half and covered with cream cheese. They were a little on the dry side but not too bad and lacked the amount of chew I was aiming for. They tasted too much of yeast, even after I cut back on the yeast. Next time, I'll be trying Bruce Ezzell's bagel recipe on Michael Ruhlman's site. This is the first recipe I studied for bagels and had planned to go with adapting it, but then suddenly decided to try converting the Joy of Cooking bagel recipe to an easy ratio instead. As noted above, it's decent but not what a bagel should be. Mr. Ezzell's will no doubt taste more like a bagel once I get around to figuring my flours for it and giving it a few trials. The ratio I used for the Joy of Cooking conversion is 9 parts flour: 4 parts liquid: 2 parts egg: 1 part fat. For this recipe, I've halved the ingredients of the original. I also greatly reduced the amount of yeast. They tasted more yeasty right out of the oven but some of that left after cooling. Boiling water with 1 Tbsp. sugar added to it. Combine hot milk with butter, sugar and salt in large saucepan or bowl. When mixture is cooled to 115 degrees, add yeast and let sit for 5-10 minutes. Sift flours together with ground chia seed. Blend in egg and flour with wooden spoon and continue to beat with hand for a couple of minutes until everything is mixed well. Cover with damp cloth and let rise in warm place for an hour and a half to two hours, until dough has doubled. Bring water and sugar to simmer in large, deep skillet or saucepan. Punch down dough and form into equal pieces (I did nine smaller bagels that fit nicely in the palm of my hand after all the rising, poaching and baking. You could do larger ones.) Roll into balls and slightly flatten in hands and make a small hole in the center with finger. Let rest for 15-25 minutes or until nearly doubled. While your water is coming to a simmer/low boil, preheat oven to 375 degrees and line baking sheet with parchment paper. Place each bagel into simmering to boiling water for one to one and a half minutes on each side. I'll tell you that I played around with this: I did some for 30 seconds on each side and they fell the most during baking. All of the bagels fell somewhat either during baking or during cooling, but the ones I poached the least amount of time flattened the most. The ones that went for nearly a total of three minutes seemed to do the best. Remove from water with slotted spatula and drain a couple of seconds before placing on baking sheet lined with parchment paper. If desired, brush tops with an egg white wash.
Bake 20-25 minutes (top rack if gas oven), or until done and not doughy inside. You may want to flip them over to even the browning out a little the last four to five minutes of baking. These taste best fresh and with some cream cheese slathered on. Enjoy! Don't forget to check out Morri's host post of blueberry oat bagels, as well as the other amazing bagel recipes baked up for you this month! Thanks again, Morri!